in the Bridge Builders’ Pathway outside our new building! 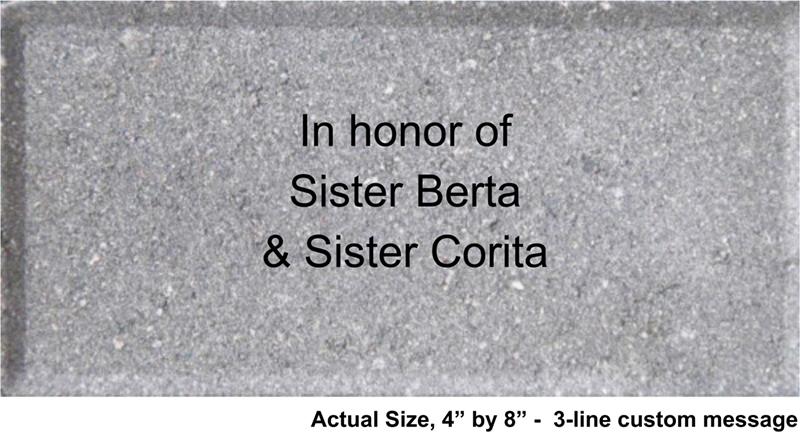 For a $200 donation to our expansion project, you can personalize a 4” by 8” brick for the walkway outside Operation Breakthrough’s new gymnasium. It’s the path our children will travel daily from their school buses into the new building. Your message can be as simple or as creative as you wish. Honor a loved one. Thank a teacher! Give a shout-out to the classroom where you volunteer. Encourage the children who will see your brick each day! Want to say a little more? Larger bricks are also available. A brick 8” x 8” is $400. For $700, you can display your message on a 12” x 12” brick. A limited number of bricks is available, so please order now. Your gift will help us open our program to 290 more children, for a total enrollment of 720, and be a lasting reminder that you support a bright future for all our children and their families!